"There would be no Angels' organization without Gene Autry. It's because of the long-time Angels' owner's love of baseball and his genuine care for those people involved in the sport that the Anaheim ballclub first began and later developed into a successful franchise. Autry, the legendary entertainer known as America's Favorite Singing Cowboy, passed away October 2, 1999, three days after celebrating his 91st birthday. 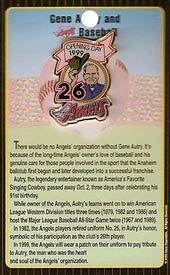 "While owner of the Angels, Autry's teams went on to win American League Western Division titles three times (1979, 1982 and 1986) and host the Major League Baseball Game twice (1967 and 1989). In 1982, the Angles players retired uniform No. 26, in Autry's honor, symbolic of his participation as the club's 26th player. "In 1999, the Angels wore a patch on their uniform to pay tribute to Autry, the man who was the heart and soul of the Angels' organization."